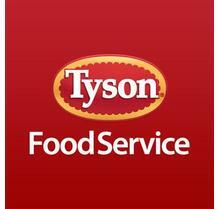 Tyson Foods is the leading supplier of protein and prepared menu solutions with an emphasis on poultry. The Tyson® brand offers an extensive line of products that fit the needs of any customer searching for the perfect balance of quality and price point. 0	jplist-folder-All-Posts-42620 jplist-folder-Recipes-44450 jplist-folder-All-Posts-42620 Recipes-Recipes	jplist-topic-bacon jplist-topic-chicken jplist-topic-Sandwich	0	08/31/2018 09:15:16	This signature menu item combines the classic flavors of Caesar salad into a fresh and contemporary form. Serve a warm, indulgent chicken club sandwich layered with a juicy marinated grilled chicken breast filet, sizzling-hot strips of smoky-sweet bacon, tangy rich-and-creamy Asiago Caesar mayonnaise, fresh spring mix salad blend, onion, roasted grape tomatoes, and Asiago cheese on a warm ciabatta roll. 1	jplist-folder-All-Posts-42620 Nutritional-Info-Nutritional-Info	jplist-topic-fat	0	03/27/2017 16:50:52	Calories in Tyson Chicken Frozen Boneless Skinless Chicken Breast, 5 oz Portions W Rib MeatNutrition FactsTyson Chicken - Frozen Boneless Skinless Chicken Breast, 5 oz Portions W Rib MeatServings: 5 oz 1 oz 1 gramCalories55Sodium0 mgTotal Fat1 gPotassium0 mgSaturated0 gTotal Carbs9 gPolyunsaturated0 gDietary Fiber0 gMonounsaturated0 gSugars0 gTrans0 gProtein2 gCholesterol0 mg Vitamin A0%Calcium0%Vitamin C0%Iron0%*Percent Daily Values are based on a 2000 calorie diet. Your daily values may be higher or lower depending on your calorie needs. 9	jplist-folder-All-Posts-42620 Quick-Post-Quick-Post	jplist-topic-Calorie-Smart jplist-topic-Dietary-Needs jplist-topic-Gluten-Free jplist-topic-Low-Sodium jplist-topic-No-Msg jplist-topic-No-Trans-Fat jplist-topic-Reduced-Sodium	0	07/14/2015 16:19:11	We have a great section on our foodservice website that describes how Tyson's caters to those individuals that have special dietary needs. You can explore products by the special dietary need category. Click the link to visit our dietary needs section.The Tyson Food Service approach to Dietary Needs helps you quickly and easily identify the right products for a healthier menu. We have redesigned our product resources to make it easier to find the products that fit within one of these six categories: Low Sodium, Reduced Sodium, Calorie Smart, No Trans Fat, No MSG or Gluten Free.Low SodiumLow Sodium products have 140mg of sodium or less per serving.Reduced SodiumReduced Sodium means the product is a 25% or more reduction in the amount of sodium from a reference food. (Reference product will be noted on label and/or spec sheet)Calorie SmartCalorie Smart products have 200 Calories or fewer per serving.0 Trans FatNo Trans Fat products have zero grams trans fats per serving.No MSGNo MSG products contain zero MSG.Gluten FreeProducts containing no Gluten ingredients.All Natural*All Natural* products are minimally processed, no artificial ingredients. 10	jplist-folder-All-Posts-42620 jplist-folder-All-Posts-42620 Product-Literature-Product-Literature	0	10/14/2014 16:48:01	Products with the Reduced Sodium claim have 25% or more reduction in the amount of sodium from a reference food (reference product will be noted on label and/or spec sheet). The Tyson Food Service Dietary Needs are designed to help you quickly locate the products you need to meet your menu’s health requirements. We are continually developing new products and adding them to our Dietary Needs list. So, check back often as these product pages are updated regularly. 11	jplist-folder-All-Posts-42620 jplist-folder-All-Posts-42620 Product-Literature-Product-Literature	0	10/14/2014 16:48:01	Inspired from the beginning by John Tyson’s ingenuity and courage, we still raise and process all our chicken with a meticulous eye toward quality. Our commitment to working at the heart of your menu spans across every aspect of the process, from how and where our chickens are raised, to innovation in product development and quality control throughout the production process, ensuring that you can be proud and confident in your decision to choose Tyson chicken.